Hey people, I am in need of an inverter to run some basic equipment from my boat that won't run on 12v. 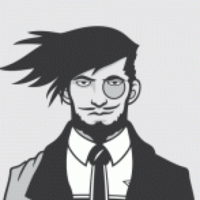 I hear great things about Mastervault (i think thats the name), Victron etc. However I do not have nearly the funds to purchase one of these right now. I don't need any kind of multi charger inverter, just an inverter hopefully around 1.5kw constant. Basically i'm looking on ebay and amazon for something cheap (< £200) that will work for the foreseeable future, dont care if it dies some day, just need something that works for now. Hoping someone on CanalWorld forums is slumming it like me and could share some advice on the best of the worst. Try sunshine power inverters on line. Good reports from several online at easier prices. Some forum members have em. 1500 watt on offer just over £200 at moment. For cheap inverters - Bursting into flames is not uncommon. I'd suggest if you cannot afford the 'correct' item then do without it until you can. Just bear in mind a 1.5 kw inverter running at full load constantly will take just a wee bit of supplying. Definitely wont need 1.5kw often at all, just want that so if in the future I want to buy the washing machine covered below I can. That washer only 1500 Watts? Remember that motors take more whilst starting, 1800 Watts may be better. Sterling gear is not rubbish and they are well known and accountable. The poster of the video runs it fine with a 1300w continuous inverter, so figured 1500 would handle it as well. I have a spare 2000w Silverline MSW which I could be tempted to sell for not very much money. It worked fine until I upgraded to a fancy PSW. That sounds great, should I send you a PM or something? The attached image shows the difference between the different types of inverter outputs. 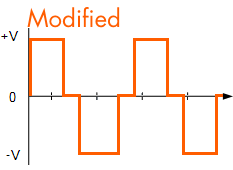 MSW = Modified Sine wave. Not very good for electronics. So the general consensus here is victron or higher, otherwise your boat will sink? Cheap but far more solid than many I've seen. MSW ran everything of mine except washing machine and electric toothbrush. I use an old powermaster inverter MSW. It has worked well for years, though I am on the lookout for a PSW one as I think it has contributed to the premature failure of the compressor motor on our freezer in the past. Prosine/Xantrex are also worth a look. They are also expensive,but can often been found on ebay at a reasonable cost. I think they use them in ambulances etc. Strangely enough, I still have the originally installed Heart Interface 2000 (designed and also used by Gibbo). 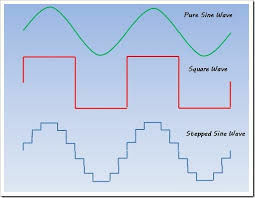 It is modified sine wave and the only thing it will not run is the equally ancient Servis Logic 1300 washing machine - it washes, but then never gets a spin cycle going, so just keeps going and going, and never spinning. The only reason the washing machine hasn't been chucked is that its built into the kitchen and we would have to take the kitchen apart to remove it. I could be wrong but I don’t believe he designed the original device. Doesn’t look like that to me. given your comments in the OP, you will be fine with a Sterling. I’ve got a Sterling inverter charger which has worked fine since 2012, along with their latest charger, which has worked fine for a year, (maybe 2? ). I wouldn't have thought the motor uses that power, it will be the heating element surely - which obviously won't really care about the waveform it sees. He might not have done but gave me lots of good advice on how to keep it going for a while longer, he knew it intimately. Supplied in May 2006 and still working when we sold up in October 2017. I’ve﻿ got a Sterling inverter charger which has worked fine since 2012, along with their latest charger, which has worked fine for a year, (maybe 2? ). Oh-oh! Kiss of death alert!